Momentary access to the world-wide-web leads away from many words toward reflection on an ancient text. I wake before dawn to see the sun rise over the far horizon beyond Lake Superior, shining its rays across the waves, a beauty beyond compare. I do not occupy myself with “great things” that matter less and things too hard for me. I am not proud. — Gordon C. Stewart, Encampment Forest, Two Harbors, MN, October 5, 2017. Standing at the edge of the pool of Blue Spring, our hearts are strangely quieted. Calmed. Still. At peace as we watch the West Indian Manatees move through the virgin waters of Blue Spring. So gracefully does the Manatee approach the spring head, the deep vertical cave through the limestone that gently empties 165 million gallons of water per day into the St. Johns River from the aquifer below, enough for every resident of greater Orlando to drink 50 gallons of water a day. The Manatee knows nothing of Orlando. Nothing of Epcot or Disney World. Nothing of vacations, technology, shopping malls, or the nearby Holy Land Experience theme park. She lives where she is . . . in this undisturbed place where she spends her winters to survive the cold by the warm water of Blue Spring. Her movements are effortless . . . fluid and gentle, like the water around her. Her huge flat tail, like a leaf wafting in a soft breeze, glides her through the aqua blue waters of the Blue Spring. Slowly, very slowly, she inches toward the edge of the black oblong opening in the water, the deep black hole in the Earth. Her tail stops moving. She stops. She stays very still. She lowers her head, like the Virgin Mary pondering the mystery of an immaculate conception, as if bowing down to the source of her life. Blue Spring is its own kind of Temple. A sacred place of the deepest silence where only those natural to this habitat belong. Today I was there, and the beauty of it deepened the sense of wonder of flesh and blood and water and algae and sabal palms and a natural quiet. 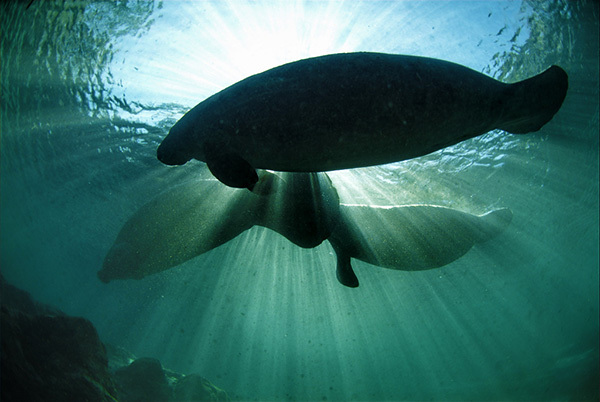 My head bows in rapture on the lonely shore, mellowed and calmed, joining the Manatee, bowing over the place deep below the surface from which the pure water flows.